Mark Warburton has stayed true to his words in regards to the squad he would build. He said he wanted to have a lean and hungry squad with young players but experienced heads as well. Players such as Kenny Miller and Lee Wallace would be important to guide and help player play in front of 50,000 fans every other Saturday. This time last season we had a squad of 28 players who had an average age of 26. We had eight players that were 30-years-old and over. We've cut all those numbers down and brought in younger more talented players. We currently have a playing squad of 23 players this should go up by one when we finally sign John Eustace. Our current average age is only 23 and we now only have two players 30 or over in Dean Sheils (30) and Kenny Miller (35). We now have nine players 21 or under and have nine between 22 and 26. We then have two players in their 'prime' years - between 27 and 29. 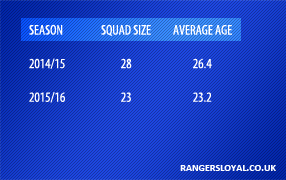 Those players being Cammy Bell (28), Lee Wallace (28) & Nicky Law (27). Mark Warburton is a manger that will develop and give confidence to our youngsters. Players such as Barrie McKay, Nathan Oduwa, Gedion Zelalem & Tom Walsh will be key for us. All 20-years-old or younger. It's changed days to going with 30+ players with limited and fading ability.